Since its inception in 1962 MAC Interiors has seen many types of interior finishing’s come and go with the changes is taste and fashion. From early VIP interiors to the business jets of today, MAC Interiors has experienced them all. But are there any products that stand out in today’s market place that will form the basis of interiors for years to come? Corian has long been used in the VIP market as the finish of choice predominantly for galley worktops. With a finish of the highest quality coupled with low maintenance requirements Corian makes an ideal choice for the VIP market. MAC Interiors spotted the potential of Corian for aircraft lavatory worktops, its durability, low maintenance and wipe clean surface, is a perfect replacement to stained vericore and stainless steel worktops. Using Corian in such a high footfall area makes a lot of sense as it is versatile, attractive and strong. 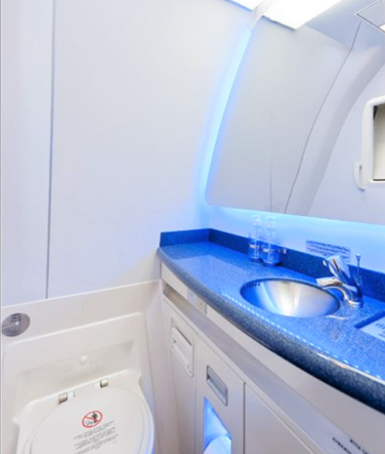 First Choice Airlines were the first carrier to switch from stainless steel worktops to Corian for their fleet of seven B767-300 aircraft; MAC Interiors carried out the work from design to installation. MAC had to overcome a number of hurdles to get Corian certified for use in aircraft, coupled with the usual rigorous testing and approval programmes. Weight issues were the main concern; Corian was seen as being a dense and heavy material unsuited to commercial aircraft; however MAC Interiors overcame this problem by investing tens of thousands of pounds in a new CNC routing machine. To maintain Corian’s structural integrity MAC ran dozens of different test programmes to reduce the final weight. With these tests completed and the clients happy, production kicked off. MAC has received hundreds of orders for our range of worktops and basins for aircraft lavatories. With heavy investment in the tools and skills needed to craft the raw Corian into beautiful worktops and basins, MAC Interiors is eager to lead the way in the retrofitting of VIP quality into tired commercial interiors that deserve a new lease of life. From household kitchen counters, to VIP aircraft, by way of extensive MAC engineering, and finally into the commercial aircraft market, Corian has come a long way and seems likely to become a far more widely used material for years to come. With over 100 different colours available, MAC Interiors is the licensed distributors of Corian and the leader in aircraft lavatory worktop refurbishments and reconfigurations. 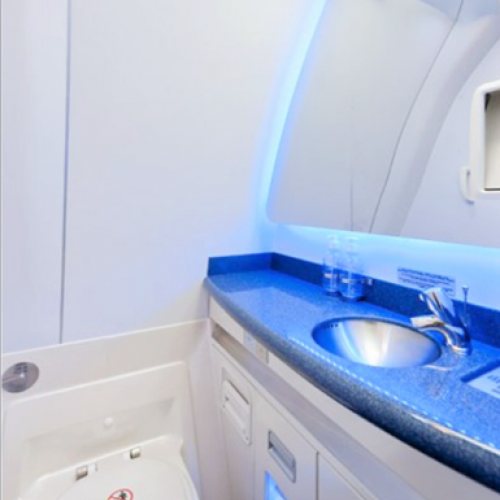 Contact our team on how Corian can be used for your aircraft lavatory refurbishment.